Mixing old school and new, 2012-13 Panini Past & Present Basketball delivers a ton of variety. Whether it's the retro look and feel of the base set or the clearly modern inserts, the product aims to take a "best of both worlds" approach. 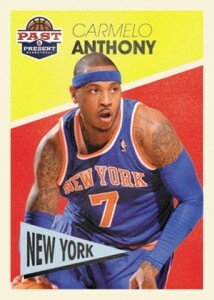 For those chasing the 2012-13 Panini Past & Present Basketball set, there are 250 cards. Mixing multiple designs, all have a throwback appearance. The checklist mixes veterans and rookies as well as 50 short print variations. Every 2012-13 Panini Past & Present Basketball hobby box has three autographs. Current player signatures fall under the Modern Marks banner. Like last year's set, Elusive Ink focuses on retired players who don't have a ton of autograph cards on the secondary market. They might not all be the game's biggest names, but they are considered fan favorites from era. 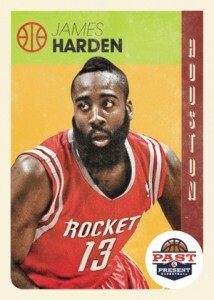 What really sets 2012-13 Panini Past & Present Basketball from other sets is its focus on unique inserts. Most take a textured approach that collectors have to hold to truly appreciate. Treads are inspired by basketball shoes. Not only do they look like sneakers, but they are designed to feel like shoe bottoms. Also inspired by player gear is Headbands, which feel like felt. Bright colors highlight Rise 'n Shine, a set that takes on a cereal box design. 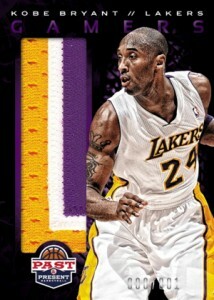 Other inserts include Raining 3s and Winning Touch Banners. Game-used memorabilia cards take a bit of a backseat in 2012-13 Panini Past & Present Basketball, but they're still here. Gamers returns from last year's set, giving collectors a large vertical jersey swatch. Good: Nice mix of retired and current players. Headbands are a fun insert idea. Base and inserts feature good variety. The Bottom Line: 2012-13 Panini Past & Present Basketball is aptly named and combines retro base designs with futuristic inserts. While high-value cards are not readily available, the real fun comes from the variety, innovative ideas and nostalgia. In this regard, Panini delivers. Panini sets up a nice trip down memory lane with the latest edition of Past & Present. From the retro box, to the wax-like wrappers and old-school base designs, this product truly feels like a blast from the past. Like 2011-12 Past & Present, the "present" aspect is not as much in play, outside of a few inserts. The base cards are composed of four noticeably different designs that are still similar enough to feel that they're part of the same set. Bright colors and off-white borders run throughout the set. Base cards come on very thin stock with no finish, so they are susceptible to damage. Several cards came straight out of packs with paper peeling on the backs. While there are no base parallels, the chase element comes from the 50-card variation set. It is hard to immediately know if you pulled one, but once you have sorted the cards, it will be clear if there is one card that differs from the other four base stacks. I only pulled one variation in my box. Inserts are the most fun part of this product and each falls about two or three per box. Raining 3's returns with a slightly updated design. The new light-colored background contrasts nicely with a water effect that appears to be the colorful ink running off the jerseys, and onto the card. Headbands are my favorite new insert in this product. 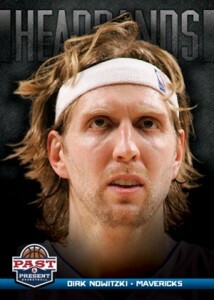 They feature large headshots of the the players with a dark background that better showcases the white headband. The unique aspect of these cards is the felt texture that's applied where the headband is located on the card. It makes for a very simple and cool idea. The same felt texture is also utilized in the die-cut, Winning Touch Banners. I feel like they went a little overboard with the fuzz on those. Also, the banner card backs chip very easily. 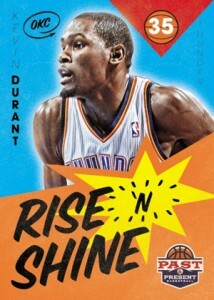 The most common insert appears to be Rise 'N Shine, as I pulled one of in nearly every pack. They feature a blue and orange, comic book design, and showcase emotional player expressions. Shattered cards give the impression of broken glass with a rainbow effect and include images of players in the process of throwing down a dunk. 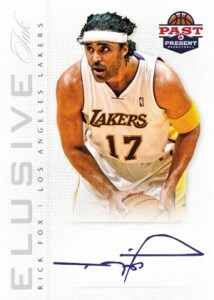 There are also Player Standouts parallels which features a black background. Lastly, there is Treads. These cards are meant to resemble the bottom of a sneaker. However, I found it it to be a little disappointing. The shoe portion only includes a fourth of a normal shoeprint, so it would not be immediately clear what you were looking at. Maybe they could have designed it to look like a full sneaker bottom and possibly die-cut. I also expected them to have a better shoe texture. The bottom had a minimal feel, at most, and certainly did not evoke the feel of shoe rubber. The common autographs are essentially base cards with a sticker signature. Although Elusive Ink is heavy on white, the simplistic design would work if not for the sticker autograph. The top autograph options include Hall Marks, which feature a horizontal design and on-card signature, and Modern Marks, which also includes an on-card autograph along with ample signing space. I feel that Modern Marks are the best looking cards in the whole product. Set builders will enjoy the fact that all rookies feature base versions that are not short printed. However, the 250-card base set will take several boxes to build as collation does not appear to be well-executed and there are only 120 cards per box. Although the autograph checklist includes some of the biggest names in basketball, collectors will likely pull sticker autographs from the base set or Elusive Inks. With so many rookie players due to the double-rookie class, the odds are not in your favor. Elusive Inks is a nice concept, but many of players on the checklist are not so much elusive as they are unpopular. Also, dispite the Past & Present moniker, there is a relative void of retired players. Relic cards are another story. After the product was released, Panini announced that they would be a retail-only inclusion. While relic cards are not viewed as favorably as they once were, the large jersey piece that was present in the product last year had developed a nice following and it is not a great move to announce this information after the cards hit the market. Value is the one main area where Past & Present comes up short. With no serial numbering in the product outside of the retail-only prime relic cards, no relic cards in hobby boxes, and a plethora of undesirable sticker autographs, monetary value is hard to come by. The only real value in this product is found in the elite base rookie or veteran autographs and the Modern Marks and Hall Marks autograph sets. If you don't pull one of these, it is unlikely that you will come close to covering what you paid. Given the multitude of Panini products that fall around the same price point as Past & Present, Panini needs to eliminate or revamp some of these products. I feel that Past & Present fills a nice void in current basketball collecting. However, if the guaranteed autographs were dropped to one or none, and the starting price was cut in half, this could be a great option for set collectors who don't want to pay extra for relatively worthless sticker autographs. With the right mindset and expectations, this set is full of fun. Bright colors, appealing designs, creative inserts and three autographs per box combine to make for an enjoyable break. Although the box price and value don't align, the price point is one of the more reasonable options from the Panini lineup. All these things make Past & Present easily one of the most unique products for basketball collectors. As of Jan 2019, this product can be found for $525/case. A really nice price for lots of cards of RC’s and vets and HOFers. 3 auto’s per box. Lots of live auto’s, few redemption’s. Auto’s have a good mix of RC’s with vets and some HOFers as well. There are some nice on card auto’s to be pulled as well. (Modern Marks, some of the Illusive Ink) Old style vintage card stock for the base set, inserts have new card stock with new technologies. From two cases I was able to build a complete base set, and some of the insert sets. (Rise & Shine, Threads, Raining 3’s) The harder to complete inserts sets are Headbands and Banners. Even more difficult to complete are the SP Variations parallel set and the Shattered insert sets, which I’m guessing may take 4-6 cases to complete because I didn’t even pull half of the sets from 2 cases. Very fun to bust, seems like decent value too. Love it! 2012-13 Past & Present Factory Sealed Basketball Hobby Box Kyrie Irving RC?